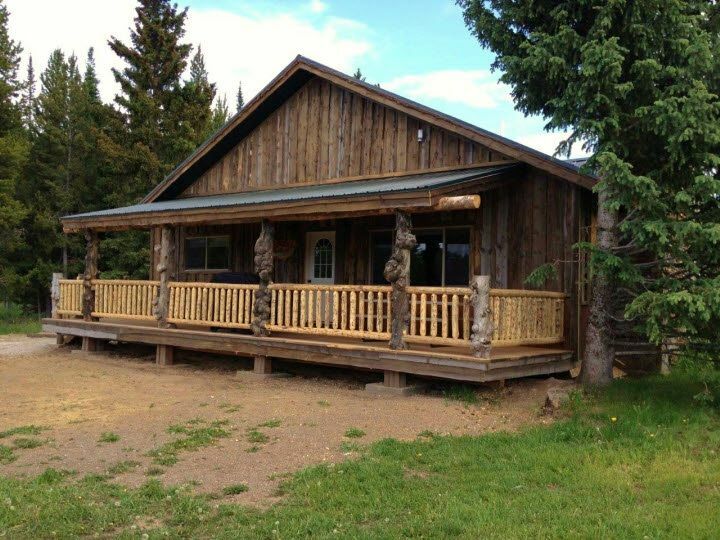 If you’re looking for a cabin near Yellowstone, the Bears Den Cabin is a newly built/remodeled 2,200 square foot cabin that boasts MAGNIFICENT VIEWS while being located just 8 miles from the Yellowstone National Park West Entrance. This roomy 4 Bedroom, 3 Bath cabin easily sleeps 14 and includes all the amenities you need to enjoy your home away from home. The Yellowstone area is a very diverse vacation destination. It is the perfect place to experience a memorable family vacation or a romantic getaway for two! * Large floor plan with plenty of room for everyone! Great location for fishing W Yellowstone area waters. Terrific accommodations for our fly fishing group. The cabin had everything we needed to cook and enjoy dinner after a day on the water. The rooms with the many beds and the three bathrooms made staying here with a group of guys very relaxing and comfortable. Lovely property. Communication from owner could have been quicker and better. Great property for size, location and amentities. As an overseas visitor checkin details in advance of our arrival would have been good as we can’t download then American app for this site. Communication could have been quicker and better, but the property spoke for itself! Great! I was very impressed with how comfortable the house was. There was tons of space and everyone was comfortable. Bill has thought of everything as there was everything you could need available, including high chairs and a pack’n play! It’s just far enough out of town that you get a sense of a remote cabin with the amazing brilliant stars at night, but you’re ten minutes from anything you could need including the Yellowstone gate. It's hard to tell you where to begin! This cabin was just perfect for our family vacation. We had seven of us, and we had so much room! The cabin was well stocked with everything that you can imagine. It was super clean, and really had that relaxing feeling after our long days in Yellowstone. Location - again, it was so close to everything, yet it also felt nice and secluded. The town of West Yellowstone was about 8 miles away (awesome town by the way), and the west entrance of Yellowstone was just beyond that. Easy drives at any part of the day. There was even a rodeo next door that we managed to find time for - it was great! Bill even went far above and beyond when we left some of our clothes in the dryer after our departure. We notified him about it, and he had them shipped directly to our house. The package actually made it home before we did. I don't think you can ask for anything better than that. Bill is awesome! Thank you so much for the best vacation that our family has had. It is certainly going to be hard to top this one. I would not hesitate to stay here again. We loved it. Bears Glen is a fantastic cabin, extremely well furnished and provides all of the essentials for any vacation. The layout, furniture and fittings have been well thought out and we cannot fault any aspect. As a party of only 4 people, we did rattler around this spacious cabin a bit, but it was comfortable and warm (it did snow while we were there). Very handy for Yellowstone Park and not too far out of the town. Highly recommended with a very obliging owner. We are very satisfied with this house. It was perfect place for our family reunion. All the kids were able to stay in one big room that was comfortable and spacious. The house was beyond our expectations. It was 9 miles and 10 minutes drive to West Yellowstone town and the West Yellowstone Entrance. We would love to come back again and we would highly recommend staying at the Bears Den. Please note that off season rates do not apply to holiday seasons. Please feel free to contact the owner with any questions regarding rates during these times. Our cancellation Policy: Cancellation less than 60 days prior to arrival will result in the deposit being forfeited, unless the cancelled dates can be filled.